Rumford fireplaces are tall and shallow to reflect more heat, and they have streamlined throats to eliminate turbulence and carry away the smoke with little loss of heated room air. Rumford fireplaces werecommon from 1796, when Count Rumford first wrote about them, until about 1850. Jefferson had them built at Monticello, and Thoreau listed them among the modern conveniences that everyone took for granted. There are still many original Rumford fireplaces – often buried behind newer renovations-throughout the country. Count Rumford, for whom the fireplace is named,was born Benjamin Thompson in Woburn, Massachusetts in 1753 and, because he was a loyalist, he left (abruptly) with the British in 1776. He spent much of his life as an employee of the Bavarian government where he received his title, “Count of the Holy Roman Empire.” Rumford is known primarily for the work he did on the nature of heat. 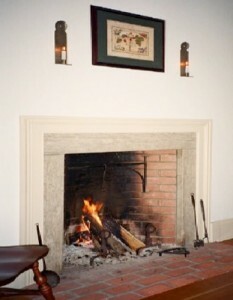 Rumford wrote two papers detailing his improvements on fireplaces in 1796 and in1798. * He was well known and widely read in his lifetime and almost immediately in the 1790s his “Rumford fireplace” became state-of-the-art worldwide. Today, with the extensive restoration of old and historic houses and the renewed popularity of early American and classical architecture in new construction, Rumford fireplaces are enjoying a comeback. 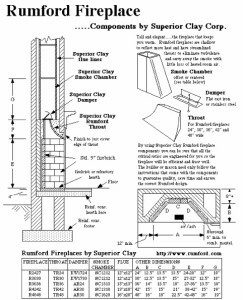 Rumford fireplaces are generally appreciated for their tall classic elegance and their heating efficiency.